Sources said the timing of Mercury's demise depends on how fast executives can persuade the brand's dealers, who also sell Lincoln models, to close or merge with Ford showrooms. DETROIT (Bloomberg) -- Ford Motor Co. is preparing to wind down the Mercury line, created in 1939 by Edsel Ford, after sales plunged 74 percent since 2000, said two people familiar with the plan. The automaker's top executives are preparing a proposal to kill Mercury to be presented to directors in July, said the people, who asked not to be identified revealing internal discussions. Mercury, losing two of four models next year, will be starved of products and promotion, the people said. CEO Alan Mulally emphasized the automaker's namesake brand as he revived the only major U.S. automaker to avoid bankruptcy. The timing of Mercury's demise depends on how fast executives can persuade the brand's dealers, who also sell Lincoln models, to close or merge with Ford showrooms, they said. "Mercury is a forgotten brand," said John Wolkonowicz, an auto analyst with IHS Global Insight. "Many Americans probably already think it has been discontinued. Mercury was too similar to Ford from the very beginning." Mulally also is unloading Ford's European luxury brands, after the automaker failed to achieve a goal to have them generate one-third of automotive profits. Ford in March agreed to sell Volvo to China's Zhejiang Geely Holding Co. It sold off Jaguar, Land Rover and Aston Martin in the last three years. Mercury would join Pontiac, Saturn, Oldsmobile and Plymouth among the departed Detroit brands of the 21st century. Sales will end within four years, one of the people estimated. General Motors Co., as part of its U.S.-backed reorganization last year, sold or closed four of its eight brands sold domestically. Edsel Ford, son of founder Henry Ford, established Mercury during the Great Depression as a mid-priced alternative to mainstream Ford and upscale Lincoln. Edsel's great grand-daughter, Elena Ford, now the automaker's director of global marketing, initially opposed discontinuing Mercury, which she was in charge of promoting prior to 2002, the people said. Doing away with Mercury is supported by Ford Executive Chairman Bill Ford and other members of the founding family, who have 40 percent voting control of the automaker through a special class of stock, the people said. With Mercury accounting for 1.9 percent of Ford's global sales in the first quarter, the family has decided ending it is best for the business, the people said. Bill and Elena Ford also declined to comment, spokesman Mark Truby said. Mercury's U.S. sales peaked in 1978 at 579,498, when it had the slogan “The Sign of the Cat.” Deliveries fell to 92,299 last year. As the U.S. auto market recovers, Mercury's sales are up 23 percent this year through April, less than Ford Motor's overall gain of 33 percent. Mercury had 0.9 percent of the U.S. market through April, unchanged from 2009. As Mulally focused on the namesake brand, Mercury withered, the people said. 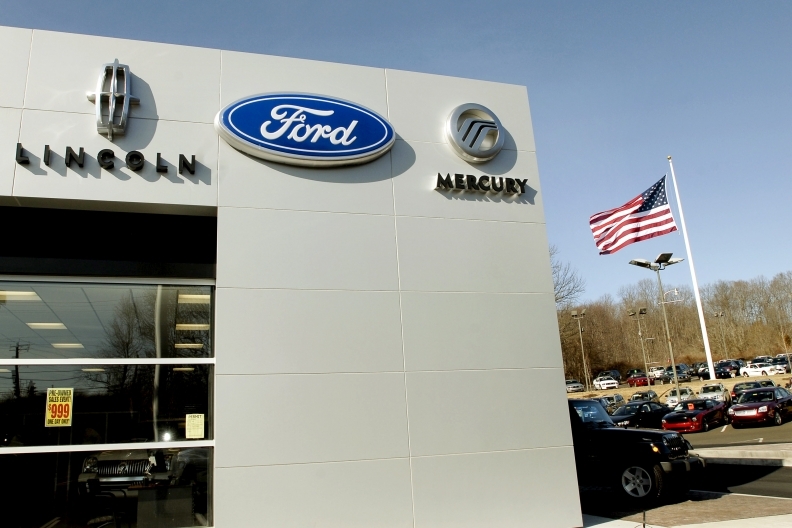 Ford's ad spending on Mercury fell 88 percent from 2005 through 2009, according to researcher Kantar Media of New York. Last year, Ford stopped selling the Mercury Sable, a sibling to the Taurus. The Mountaineer, Mercury's version of the Explorer, is to go away next year as Ford rolls out a new version of the SUV. Since Mulally's arrival, Ford stopped giving Mercury exclusive features and technology, the people said. That made Mercury less distinctive than comparable Fords, which tend to be priced lower. Mercury's top-selling model is the Milan, a sibling of the Ford Fusion, with sales up 53 percent this year. Mercury also sells its own version of the Ford Escape SUV, known as the Mariner, which has had a 22 percent sales gain through April. Ford is scheduled to replace those models in 2012 and 2013 and could drop the Mercury versions, Wolkonowicz said. Mercury's second best-selling model, the Grand Marquis, is being retired next year as Ford stops producing a trio of large, rear-wheel drive sedans that also includes the Lincoln Town Car and Ford Crown Victoria. Mulally has emphasized more fuel- efficient models, such as the Fiesta and Focus small cars Ford is introducing this year in the United States. Neither has a Mercury counterpart. Mercury's cultural heyday came in the 1950s, when hot-rodders favored its engines, which were larger and faster than those found in Ford models, Wolkonowicz said. Along with Lincoln, Mercury sponsored “The Ed Sullivan Show” on CBS in the 1950s and 1960s. Detective Steve McGarrett drove a black Grand Marquis in the “Hawaii Five-0” TV series on CBS in the 1970s. As Mercury's sales plunged, so too have its profits, Wolkonowicz said. With one-quarter of the sales it had a decade ago, it's hard to rationalize the line's continued existence, he said.